When St James's was built in 1863, the churchyard was just a small area immediately surrounding the church, the cemetery at the mother church of St Mary's, Hampton, still serving the new parish. This page covers changes and developments in the churchyard. Have a look at The churchyard through the years which shows what happened from when records began up until 2017. 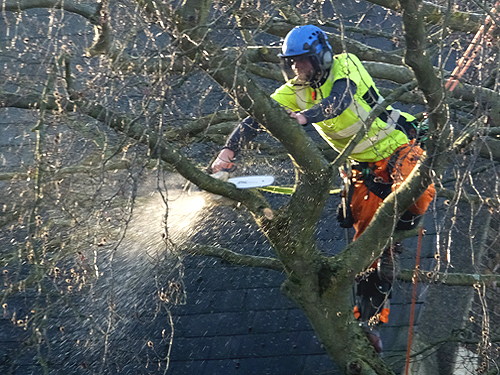 In January 2017 the copper beech, on the corner of St James's Road and Park Road, became unsafe after being attacked by a giant fungus and had to be felled. Read the article A sad farewell to the beech tree. A new bench made from beech wood was installed by the south porch. It was given to the church by the local council after they had cut down the tree. A new beech was planted in its place. There was an excellent turnout for the new Gardening Club which started in December 2017. 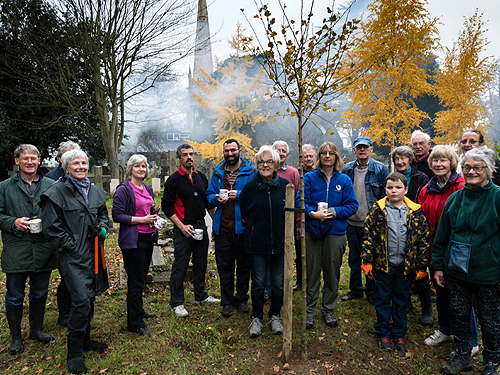 Various parts of the churchyard were tidied up and four trees that had been given to the church by the Mayor of London’s 'Trees for Sacred Spaces' project were planted. In the spring of 2018 the area around the bottom of the tower was cleared and shrubs and daffodils planted. 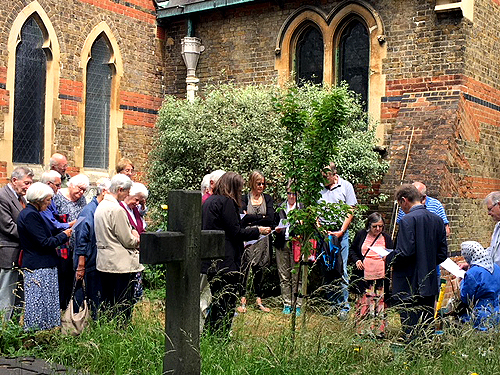 During the course of the year several saplings were planted in memory of members of the congregation. The Gardening Club contined to meet every few months and in the autumn work on the new wild flowerbed started in earnest. This was part of the idea of managing the churchyard as a local wildlife conservation area. See the photo album Gardening Club.